What a week!! Unfortunately I have had one hell of a busy week which has resulted in me having to skip some training sessions, although I've still managed to get out for my morning walk. My diet has been off the ball as well due to me being out and about with my client. As an example, on Thursday night after managing to grab a protein bar I always keep handy when at work, my client decided he wanted me to join him for a last minute three course meal. His culture means that to refuse his hospitality, no matter what the grounds, would cause upset. As I'd already eaten all of my required calories for the day I went for the lightest I possibly could. I was able to get away with a tuna steak salad to start, a parma ham salad for main with olives, sun dried tomatoes and artichoke hearts and a small fruit salad for desert with mineral water to wash it down. It was all very, very nice (the benefits of working in personal security!) but was essentially a 3 course meal more calories than I needed! Training wise, due to me finishing early, I've skipped a few workouts. A couple of day have resulted in me getting 4 hours sleep so I've left the gym sessions on those particular days. Tomorrow will be back to normal so back in the gym before work. I've now updated my pictures for my weigh in the 1 April as well as the comparison shots at the top of my blog. That's it for now, looking forward to a good night's sleep tonight and getting back in the gym tomorrow. The last set of 70kg for this was very hard and pretty much my limit. Looking forward to doing this again in a few months to see if I can improve on it. Diet today was spot on. Right, now for the weigh in. 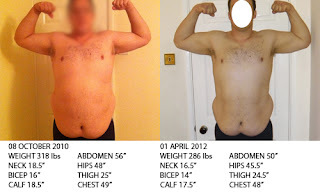 My previous weigh in weight on the 22 March was 293lbs / 132.9kg, my weigh this morning was 286lbs / 129.7kg!!! That's a loss of 7lbs / 3.1kg in 9 days!!!!! I'm very happy with that, although I'm a little concerned that I may have lost muscle tissue as well as fat as that is an average of about 5 lbs a week, but some of that could be water, and it might stabilise over the next week. One thing I want to make sure I'm doing is losing body fat and not just bodyweight as they are two completely different things. I've also lost .5 of an inch off my abdomen, .5 of an inch off my calf, 1 inch off my chest, .5 of an inch off my hips and . 5 of an inch off both my neck and thighs. Diet today was slightly off. Woke up with a breakfast shake as per normal. Mid morning I had some bacon, poached eggs and tomatoes, then for lunch was a Sunday Roast in the garden with my wife and kids. I'm working night's again now for a couple of days so was in bed by 15:00 and back up at 18:00 to start the day with another breakfast shake. Training wise today was bad. I went into the gym to do a workout, but got 1 round into it and had nothing left in me. I felt too drained and decided to knock it in the head. Monday is supposed to be a rest day, but I will train to make up for today. All together not a bad day. I'm very happy with my results so far. Well today was a busy day. I started off at 6:30am with a 30 minute fast walk with the dog, followed by a quick chest workout. The CrossFit WOD (Workout of the Day) today was a difficult one, and would take more time than I had so I changed it to a chest workout followed by a 4 minute Tabatta. 70kg, 75kg, 80kg, 80kg, 80kg. Diet wise was spot on again and got an early night tonight. My wife was out with some friends so it was just me and the kids by the time I got in from work at 21:30. I was in bed by 22:00 to catch up on some lost sleep. I'm looking forward to my weigh in on Sunday morning to check my progress so far. I finished work at 10am this morning and left at about 10:45 after having a catch up with someone I hadn't seen for a while. I was already low on petrol when the government, in their infinite wisdom, decided to tell people to stock up on fuel. So I went to a couple of petrol stations on the way home and after queuing up for fuel for 20 mins, they ran out. Was a little angry at this point because 1. I only just had enough fuel to drive the 50 miles home, so if I hit any traffic I could end up running out, 2. there is NO strike planned yet by the fuel lorry drivers. All this panic is because people are just listening to their friends and hearsay and not looking into things themselves. If the lorry drivers do strike they need to give a week's notice, so what's the point in filling up your car now, unless you plan on not driving for a week!!! So anyway I drive home, and make it with 5 miles left on my fuel counter, and have to queue at my local station. By the time I get in it's 12:30 in the afternoon and I get into bed at 13:00, very tired!! I was planning on getting up at 15:00 -16:00 and going out with the dog for a bit of light exercise (walking) but was too tired and didn't wake up until my wife and kids came home at 18:30. Not much of a worry as it was my day off from training anyway. I had a protein shake when I woke, with the usual 300ml of milk, banana, peanut butter and added a teaspoon of coffee granules as my protein powder is cappuccino anyway. It went down a treat and was just what I needed to wake me up from that groggy feeling you get after only a few hours sleep. For dinner my wife treated me to a steak with sweet potato and butternut squash oven baked chips,and cheese covered potato skins. OK the cheese covered baked potato skins are not an ideal choice but when you consider that since 9am that morning all I'd had was a protein shake due to sleep, it's not actually that bad. Off to bed again at 23:00 to sleep and switch my body back over to day time shifts, then up again at 06:00 to train again. Well today was a pretty uneventful day on my road to fitness. I managed to get 5.5 hours sleep, but was woken up a few times due to it being roasting hot in my bedroom and once by the dog who decided to lick my face while I was asleep. I wasn't too happy with that, but she's such a sweet dog so I let it go! Diet wise today, well tonight was spot on. Training should have been a 2km row but as I don't have a rower a good substitute is to do Sumo High Pulls with a 25kg bar, each rep being 10 metres, so I did 200 reps. Here's a demo of what a Sumo High Pull is. All in all, apart from the lack of sleep (which is the norm for me when I'm on night shifts to be honest), another good day! So what am I basing my diet on? Well I've taken quite a precise approach to this, basing my figures on nutrition guidelines that I've read over the years for bodybuilding. I will be basing my macro nutrient (Protein, Carbohydrates and Fat) ratios loosely on the Paleo diet. I say loosely because although I feel that the Paleo way of eating is probably the easiest way to heat a good healthy diet, it's not great if you don't always have a lot of time, so for me, I eat Paleo, but then add in some protein supplements. My weight at the start was 134.5kg. So 13.7 x 134.5 = 1,842. My height is 190cm and when multiplied by 5 = 950. My age is 30 years and when multiplied by 6.8 = 204. That leaves me with a BMR of 2,654. You then need to work out your activity levels for the day and use the multipliers below to get your total calories needed for the day. For me I have chosen Light Activity. The reason being is that my work is not very demanding physically, but I workout 5 - 6 times a week. So my total BMR is now at 3,649. Now a point to note is that for the severely muscular or overweight this can be very inaccurate. It will tend to over-estimate calorific needs for people with excess fat (me) and under-estimate people with high levels of muscle tissue (bodybuilders). The reason being that fat needs less calories than muscle, and visa versa, and this formula takes into account your total bodyweight, rather than your lean mass. There is a method for calculating your BMR using your lean mass which I will go into in great detail in a later post. What I advise you to do is use this as a guide. If you're aim is to lose weight, then drop your calories by 500 per day to start off with and see how your weight loss and energy levels go for a couple of weeks. If your weight loss is around 2lb per week then your good, if it's less, then drop your calories a little more, if it's more than increase your calories a little. For me, I know that I lose a good amount of weight each week while maintaining good energy levels at just over 2,000 calories a day, so this is what I stick to. The supplements I use are Iron Science Whey Concentrate, Iron Science Fish Capsules, Holland & Barrett Green Tea Extract Capsules and Centrum Performance Multi Vitamin. So there you go. Got there in the end. This is my plan food wise, but you'll notice over time that I won't stick to this religiously. As I've said before, I've lifted weights for years now and am nutritionally aware, so to speak. Because of this experience I have I am quite happy making substitutes if need be while out an about with work etc. All it takes is a little bit of dedication and the checking of food labels before you buy items and it's quite easy to get the same nutrients. I will also, every now and then be having day's off from the dieting and will indulge in whatever foods take my fancy. The reason for this is that, as demonstrated last week, it's OK to have a little bit of "undesirable food" every now and then without it effecting your dieting goals. It also helps to keep you sane, and has even be suggested to boost your metabolism back up. Not much to report today. Diet was as planned and training was good. As I'm on night shift's at the moment I only manage to get about 5.5 hours sleep, so have no time to go for a walk pre-workout, and that's the norm when I work nights. No where near enough sleep, but needs must, and it's part of the job, unfortunately. As I said, training was good. Tonight I done Annie (I do all my training upon waking). I managed to complete this workout in 15.23. Hi, my name is Mike. I’m a 30 year old father of three girls who has over the last few years let his body slip. I used to be in the British Army and was pretty fit, but years of long hours at work and a lack of interest in keeping in shape have caused me to become very fat. Now I am relatively fit for my size and have a good knowledge of fitness and nutrition, I’ve also lifted weights for roughly 12 years. So how, if I have the knowledge, did I let myself become fat. Well I work between 60 and 97 hours a week. Because of this I lost my motivation for training and started taking a really relaxed attitude to it. The reason I work so many hours is because I work in the bodyguard and personal security industry, which unfortunately means that at times your food choices are restricted to what your client want’s, which isn’t always a healthy choice. But these are just excuses. I will be using this Blog as a record of my progress and hope that this will inspire others to do the same.